Lavinia Greene married Harvey E. Messenger, son of Truman Messenger and Lois Higley. Alfred Holcombe was born in August 1855 at IL.1 He was the son of Warren Jarvis Holcombe and Sarah Elizabeth Bass. Alfred Holcombe married Jennie Croxell. Alfred Holcombe was buried at Correctionville, Woodbury Co., IA. Mary Eliza Messenger was born on 8 June 1839 at Huron Co., OH.1 She was the daughter of Harvey E. Messenger and Lavinia Greene.1 Mary Eliza Messenger married John Bechtle. Mary Eliza Messenger died on 25 March 1907 at Princeton, Franklin Co, KS, at age 67. She was buried at Mount Olivet Cemetery, Franklin Co., KS. John and Mary "Becklet" were enumerated in the 1870 Ohio, Franklin Co., KS, federal census. He was a farmer, age 34, she was 31. Children in the household were Betsey 10, Phebe 9, Charlie 7, Frank 3, and Grace 1 month. John and Mary E. Bechtel were enumerated in the 1875, Ohio, Franklin Co., KS, State census. He was a farmer, age 39, she was 35. Children in the household were Betsey L. 15, Eva A. 13, Charles 12, Frank 8, Ella May 3, and Rufus 11 months. John and Mary E. Bechtelle were enumerated in the 1880 Ohio, Franklin Co., KS, federal census. He was a farmer age 44, she was 40. Children in the household were Betsy L. 20, Eva A. 18, Charles L. 17, Frank 13, Ellis M. 8, Rufus W. 6, and Herman 3. John and Eliza Bechtle were enumerated in the 1885 Lincoln, Franklin Co., KS, State census. He was 50, she was 46. Children in the household were Charles 22, Eva 21, Frank 18, Emma 13, Rufus 12, and Herman 9. 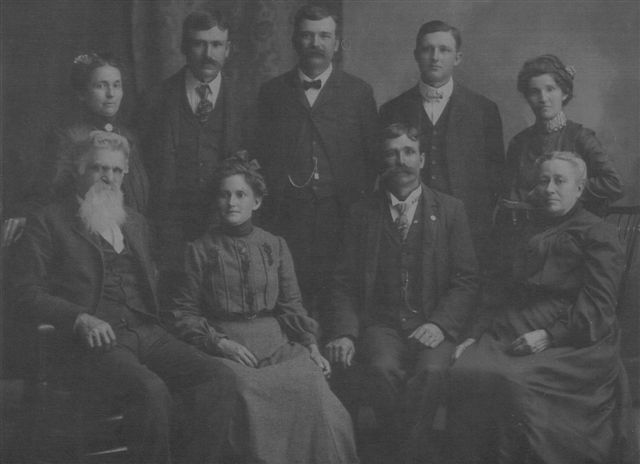 John and Mary E. Bechtle were enumerated in the 1895 Ohio, Franklin Co., KS, State census. He was 59, she was 55. Children in the household were Rufus 20, and Herman 18. John and Mary E. were enumerated in the 1900 Ohio, Franklin Co., KS, federal census. He was a farmer, age 65, she was 60. The only child in the household was Rufus W. 25. John was enumerated in the 1910 Ohio, Franklin Co., KS, federal census. He was a farmer, age 75. The only child in the household was Rufus W. 35. There are errors in Griswold. [S116] Esther Griswold French and Robert Lewis French, Griswold, page 249. [S135] Judge Oliver Seymour Phelps Phelps Family, vol. 1, page 647, item 3291. [S135] Judge Oliver Seymour Phelps Phelps Family, vol. 1, page 647, item 6638. [S137] Elisha Scott Loomis, Joseph Loomis, page 171, item 435. [S137] Elisha Scott Loomis, Joseph Loomis, page 225, item 1095. [S135] Judge Oliver Seymour Phelps Phelps Family, page 511, item 2347. [S137] Elisha Scott Loomis, Joseph Loomis, page 332, item 2758. [S182] Social Security Death Index (on-line), Ancestry.com, SSDI, Ancestry.com, SSAN 532-58-4077. [S137] Elisha Scott Loomis, Joseph Loomis, page 470, item 5922. [S182] Social Security Death Index (on-line), Ancestry.com, SSDI, Ancestry.com, SSAN 545-70-3469. [S137] Elisha Scott Loomis, Joseph Loomis, page 566, item 9794. Martin Wilson Griffin was born on 8 March 1854 at East Granby, Hartford Co., CT. He was the son of Homer Griffin and Susan Jane Griffin. Burton Lemuel Griffin was born on 25 June 1866 at East Granby, Hartford Co., CT. He was the son of Homer Griffin and Susan Jane Griffin. Burton Lemuel Griffin married Bertha Louise Beman on 20 October 1891. [S135] Judge Oliver Seymour Phelps Phelps Family, vol. 2, page 999, item 6638. Roswell Wickwire was born in 1770. He married Sarah Holcombe, daughter of Amasa Holcombe and Eunice Morse, circa 1792. Roswell Wickwire died on 29 October 1809. [S135] Judge Oliver Seymour Phelps Phelps Family, page 295, item 950. Albert G. Wickwire was born on 17 March 1807 at VT. He was the son of Roswell Wickwire and Sarah Holcombe. Albert G. Wickwire married Rebecca G. Griswold on 20 January 1834. Albert G. Wickwire died on 21 August 1839 at CT at age 32. [S135] Judge Oliver Seymour Phelps Phelps Family, page 179, item 327. Albert James Wickwire was born say 1834 at PA.1 He was the son of Albert G. Wickwire and Rebecca G. Griswold. Albert James Wickwire married Jerusha O. Pitcher on 18 October 1859. Albert James Wickwire was buried at Tioga Point Cemetery, Athens, Bradford Co., PA.
Albert and Gerusha "Wickweave" were enumerated in the 1880 Athens, Bradford Co., PA, federal census. He was a blacksmith, age 46, she was 41. Children in the household were Mary 18, Elmira 16, Connie 12, and Frank 8. Gerusha was enumerated in the 1900 Athens, Bradford Co., PA, federal census. She was a widow, age 60. Also in the household were daughter Carry Bridge, 31, a widow, and her child, Emmerson F. Bridge 5. [S135] Judge Oliver Seymour Phelps Phelps Family, vol. 1, page 213, item 465. [S135] Judge Oliver Seymour Phelps Phelps Family, vol. 1, page 214, item 1332. [S135] Judge Oliver Seymour Phelps Phelps Family, vol. 2, page 1371, item 518. [S135] Judge Oliver Seymour Phelps Phelps Family, vol. 2, page 1371, item 986. [S135] Judge Oliver Seymour Phelps Phelps Family, vol. 2, page 1371, item 987. [S631] Brent M. Owen, "Rev. John Owen." Honorah grew up in East Otis and met Barnes Hubbard who worked at his father’s rake factory at Spectacle Pond near Sandisfield, MA. They fell in love and were married at Otis by Rev. Joseph L. MIlls, minister of the Becket Congregational Church. Family lore has it that they were the handsomest couple ever to be married at Otis Congregational Church. As newlyweds Barnes and Hanorah lived at Colebrook, CT where their first 5 children were born. The New England winter of 1816 was a cold and harsh one for residents. The Hubbards decided to move west to Ohio. Barnes sold his CT property and purchased land at Lenox, Ohio, from the Connecticut Land Company. The journey west was made by covered wagon drawn by a team or oxen. For six weeks Barnes, Hanorah, Harvey, Polly and a family friend, Miles Ramsom followed forest trails and the shores of Lake Erie to reach friends at Amboy, then called Salem and now part of Conneaut, Ohio. Miles Ramsom told stories for years about how he carried Harvey and Polly on his back much of the way. The family liked the Amboy area and decided to settle there. Barnes sold the Lenox property and purchased land that is still in the Hubbard family today. They build a two room log cabin and Barnes made rakes and tools there too. Later he built a tool factory and became the neighborhood dentist. The Hubbards still possess a ferocious looking turnkey that Barnes used to extract teeth. The turnkey had a wooden handle and a wicked looking hook which was just the ticket for pulling pioneer teeth. A whiskey bottle was kept on the mantle to use for easing pain. Four more children were born. Sally Phelps, sister of Hanorah came west to live with the family and help care for the children. Within a year of Honorah's death Barnes married Sally and they produced four children of their own. The year 1826 saw Barnes and Sally building a two story brick house with a garret that must have been fine for the times. The bricks were made on the site. A chimney was placed at each end of the house. When the wind blew from the east the fire had to be in the west fireplace and when from the west only the east fireplace would draw. Sally told her granddaughter Nora Hubbard Vosburg that she had to stop in the midst of cooking meals to shift eh fire from one fireplace to the other when the wind changed directions. [S628] "Unknown short article title." Jennie Croxell married Alfred Holcombe, son of Warren Jarvis Holcombe and Sarah Elizabeth Bass.